The new Grove Vale Library is almost twice as big as its former site, good news for the oversubscribed children’s story-times and rhyme-time sessions. People who use the library were invited to let the council know what they wanted. The name of the library, the extra morning opening hours, new books, free Wi-Fi and some of the many groups and clubs, all reflect the wishes of local users. The library in East Dulwich houses a comprehensive range of books, e-books and e-magazines for adults and children. It also offers internet and Wi-Fi facilities, more study spaces, a flexible space for children’s activities and events, and a community meeting room. 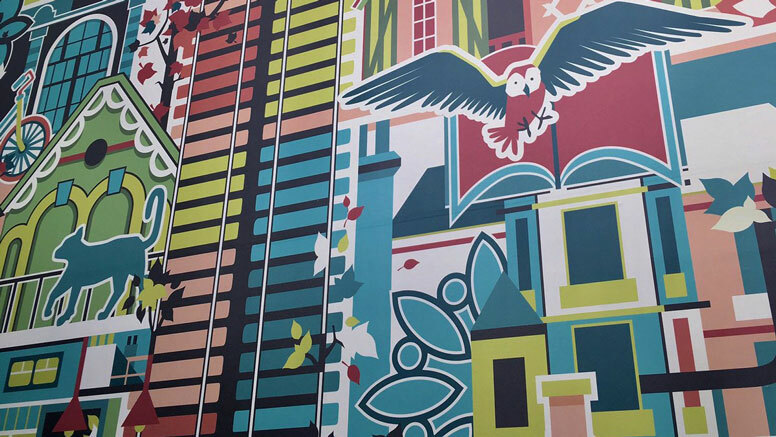 The council commissioned local artist, Lasma Liepina, to create a large-scale artwork (illustrated above) for the entrance of the new library. Her work, History Made in Dulwich, is inspired by local nature, history and architecture and told through an intricate illustrated timeline from the year 967, when East Dulwich was a dill meadow, through to the present day. The new library was made possible by working with Northridge Capital; it is part of their new development, which also includes housing and a Marks and Spencer store, all adjacent to East Dulwich station.